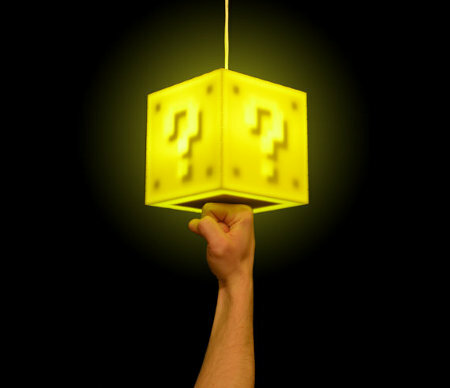 Those of you who are absolutely in love with what Nintendo has delivered via the Mario Bros. universe will definitely fall in love with this $74.99 fixture in your home – coming in the form of the Interactive 8-bit Question Block Lamp. Taking up to 2 weeks to process an order simply because it needs to be built from scratch, this labor of love is custom made right from the get go, measuring 6″ x 6″ x 6″, and is made out of laser-cut plexiglass. Inside, you will find energy-efficient LEDs running the show, while the lamp itself is light enough to be suspended from an integrated 11-foot power cord. It will work just about anywhere thanks to it being 100v-240v compatible, and there is also a custom acrylic stand sold separately if you prefer to place it by your bed. Unlike in the Mario video games, you need not punch this lamp, although a slow motion punching action that ends with a light touch will suffice in turning the lamp on or off. Each eighth time you toggle the light, you will be rewarded with a 1-Up noise, but standard “punches” will play back a classic coin noise. Possibly the best lamp I’ve seen in my life, even the fact that it must give of a really yellow light (reducing it’s practicality to near zero) doesn’t put me off.